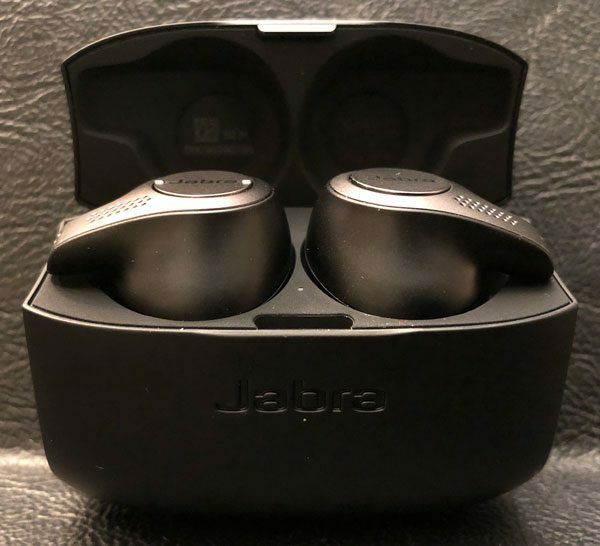 Jabra’s Elite Sports truly wireless earbuds were my favorite earbuds of 2017, perhaps ever… Their secure fit, comfort, quality, rugged build, and sound experience was second to none in the cord-less, fitness world of music listening. Though recently Jabra has introduced several additions to their Elite line of wireless earbuds: Elite 45e, Elite 65t, and Elite Active 65t. 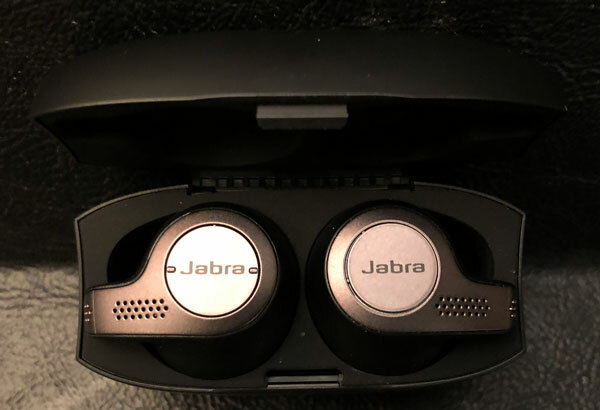 For this review, Jabra has sent me the Elite 65t’s to give them a try and see if they live up to the originals I’ve come to know and love. The Elite 65t’s design is a departure from Jabra’s classic fin-stabilized form factor. Unlike its predecessor, the 65t’s molded shape is all that is needed to securely hold the earbuds in your ears. Inserting them into your ears is a simple quarter turn process…as easy as turning a 90-degree valve. The exterior of the earbuds is made of a gray metallic plastic with Jabra stamped in the center of both multifunction buttons. Each earbud has two microphones for better ambient noise and wind reduction, making for crisp clear calls on both sides of the conversation. The rest/majority of the Elite 65t earbuds are a hardened black plastic, each with a pair of metal connectors for charging in their case. The Elite 65t earbuds’ material and build quality are both very good, as you would expect from a high-end and relatively expensive set of headphones. The Elite 65t’s have a very tight build and an IP55 rating against dust and water, meaning they can survive moderately sweaty, rainy workouts. Jabra offers a one year warranty on parts and workmanship and two years against failure due to dust, sweat, and weather. The Elite earbuds are direct competitors of Apple’s AirBuds and crush them in nearly every category including: secure fit, features, controls, and overall looks. I admit style is subjective, but Apple’s earbuds look like white dangly earrings from the 1980’s that could come falling out @anytime. The Elite’s secure fit, compact design, and subdued looks are much more me. The charging case is small, black, and well made. It is meant to not only charge the Elite earbuds but store, transport, and protect them as well. The case is powered by a micro USB charging port on the base. There is an associated status LED meant to let you know when it needs to be recharged, is charging, or fully powered up. The top third of the case opens to reveal two form-fitting spaces for the earbuds, with a LED in between that lets you know if the headphones are fully charged and ready to go. The lid has a tight and very firm seal that can be tricky or an effort to open. But with a bit of practice and use, opening the lid becomes easier as the case/mechanism wears in. When the earbuds are in the case, LEDs on their exterior momentarily pulse, depending on how charged they are (green) or that they’ve made contact with the charging points as you store/charge them (red). Jabra promises 5 hours of use before needing to recharge. The storage case has an internal battery with two additional charges before the 65t + case needs to be plugged back in. If your earbuds run out of power and you want to use them on the fly, a quick 10-15 minute charge gives an hour plus of listening, long enough for most runs, commutes, phone calls, even most shows and videos. The earbuds themselves are relatively lightweight (the right-ear at 6.5g, the left, 5.8g) and so comfortable, you barely know they’re there. The right bud has a single multipurpose button for call answering, pausing/playing music, and pinging your smart-devices’ digital assistance (longer press) and the left is a rocker button with two small tabs for managing volume and track skip/repeat (longer press). Jabra includes three sets/sizes of silicon EarGels meant to help find an ideal, custom fit. With the right fit, the Elite 65t earbuds are very comfortable to wear producing excellent sound. Jabra’s new wingless design works extremely well, providing a secure fit second to none. Once inserted into my ears, I rarely had to adjust them for comfort or better sound. Even when pressing either multifunction buttons (aka adjusting volume or answering a call), the Elite 65t’s remain securely in place. 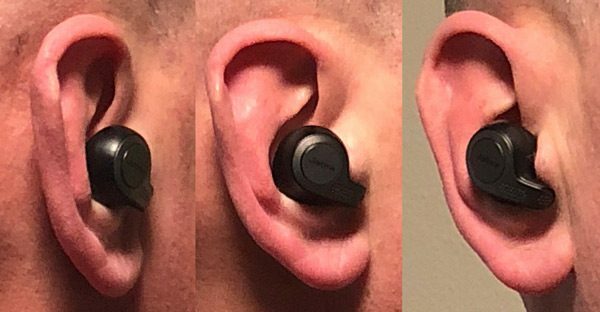 The easiest way to get them properly situated/inserted is to position each earbud with the arm facing straight down, and then twisting backward. The arms should point toward your face with a slight downward angle, as pictured above. As with most/all earbuds, the better the earplug-type of fit you can get, the better the sound quality and passive sound isolation. Overall the sound experience was excellent on all fronts: music, video, calls, and video chat. Bottom line: the Elite 65t’s are the best sounding earbuds I have ever used or tried. The Elite 65t earbuds work and sound great straight out of the box. That said, the Jabra Sound+ is a companion app that enables you to tweak your experience as you see fit. The app is available for Android and iOS and has a handful of useful features including: Voice Assistant, Audio Experience, Call Experience and Equalizer. The software also allows you to see how much battery life each earpiece has left and whether or not it is time to update the Elite’s firmware. Voice Assistant allows you to toggle between your smartphone’s default assistant, Siri, Google, or Amazon Alexa (coming soon). I tried this feature with Siri and it worked just fine. Call Experience allows you to adjust the volume of your voice you hear on the call, enhance the treble or bass on the call, and hear the name of the incoming caller (aka caller ID). Audio Experience allows you to toggle on/off the HearThrough function, Auto Pause, and Headset Prompts. The Music Equalizer enables you to manually adjust a five-band equalizer, which ranges from 60 hertz to 14 kilohertz. This feature works well though I was more than satisfied with Jabra’s default sound. As with its predecessor, when it is time to update the earbud’s firmware the app will let you know. As you proceed, the app prompts you to place the earbuds in the charging case then the LED status light flashes purple to signify the update is in progress. The light flashes green when the process is complete. The Elite 65t’s can be paired with eight different devices but unlike its earlier siblings, they can be connected to two devices at a time (multi-connect). When removed from their case, they automatically connect to the last paired device it was streaming to. When you remove one bud from either ear (as in, to have a conversation with someone) they automatically pause whatever you are listening to and start again when reinserted. They disconnect when placed in the charging/storage case. The Elite 65t’s worked very well with all the devices I paired them with from my Apple Watch to my laptop. As I stated above, the Jabra’s Elite Sports continue to be one of my favorite earbuds, especially for epic, sweat-soaked workouts. That said, the Elite 65t’s have become my new goto headphones the rest of the time. Their comfort, secure fit, sound quality, and overall design are excellent and really the truly wireless earbuds to beat. I worry a bit about damaging/destroying them during an extra sweaty workout thus the reason I continue to use the Sports during long runs. But overall, I carry the Jabra Elite 65t earbuds with me throughout my day for listening to music on the bus ride into work, video on the elliptical machine, running stairs @lunch, or just walking around town. 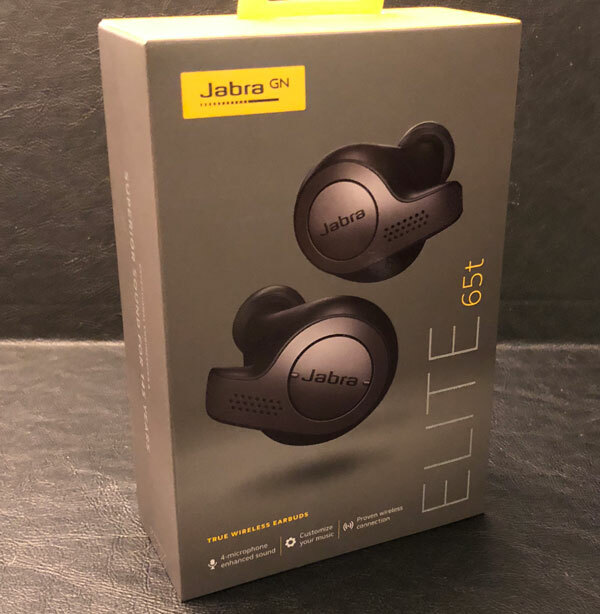 Where to buy: The Elite 65t’s are available from Jabra or Amazon. I’m curious about the multi-connect feature. Can you test something out for me? 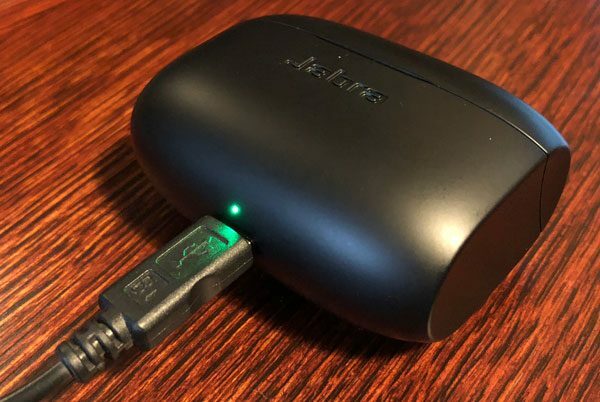 Can you connect the Jabra to a phone and also to a laptop/tablet. Play music on the laptop/tablet and have someone call your phone. Does the Jabra cut off music and give you an audible notification of the call and be able to answer the call directly on the Jabra? Thanks!! Worked like a charm. I was connected to my 12″ MacBook watching a video and also connected to my iPhone. When my smartphone rang, the video paused and I was able to take the call. Once I hung up, the connection switched back over to the laptop and the video continued. Very seamless. Can I use just one ear at a single time or do both ear bud need to be in to make phone calls? You can do either: both or just the right one. The real question is how does it do for running? Will it fall out or need constant adjusting to stay in the ear when jogging. The manual says that it can be connected up to 8 devices, how can I switch/choose between connected devices? Is it easy? For example, I mostly use earbuds with iPhone and Apple Watch at day time, but want to use it with iPhone and PC at night time, how can I switch to PC? Having the same issue. Using the mobile device primarily but when I occasionally want to switch to Laptop (Mac) and Apple Watch. I have to hold the right earbud for 10+ seconds, restart and re-pair by going in the settings/bluetooth, selecting Jabra Elite 65t and “Forgetting the device” and then it reconnects successfully however any previous pairing is wiped which is annoying. Do I need to do a proper reset and pair the headphones with all devices in one go? i just got these and I am having the same issue. Did you ever figure it out? yes, it worked in the end. Hi, I was just wondering, how do you switch media between devices on the Jabra? I currently have them paired with my Macbook and iPhone. However I cannot play music on my iPhone unless I pause music or any source of media on my Macbook first and vice versa. The earbuds seem to not switch automatically between the two devices themselves. Was just wondering if you encounter the same issue? Thanks!